Thanks to the great work of County Sports Partnerships, all our partners and supporters, with your support we've raised the profile for physical activity at work and independent research from Loughborough University has helped to build the evidence base. Together we have helped over 75,000 employees from thousands of workplaces across England to move more and to take on the challenge of adding more activity in and around the working day. 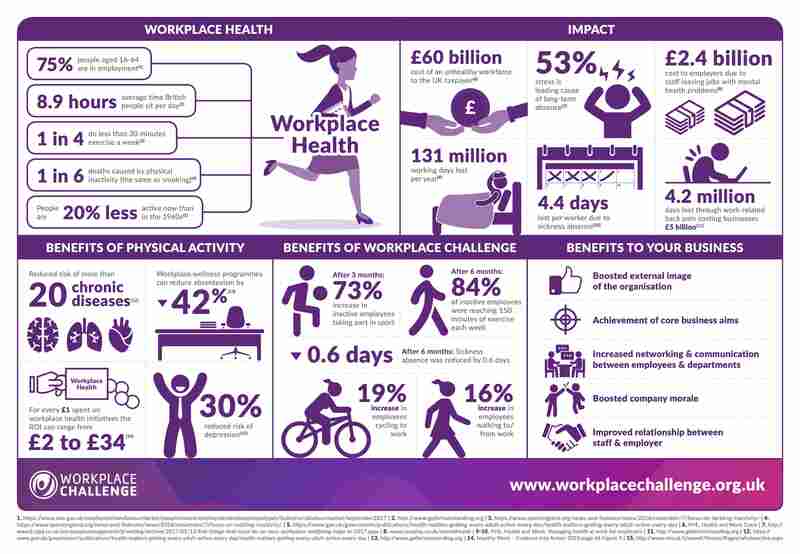 On 7th October Workplace Challenge ended and CSP Network is now focusing on a new model for workplace physical activity, based around a hub with tools to help employers and particularly champions to tackle inactivity. The main change is that we're moving from an employee facing programme to a new model that provides employers with inspiration, tools and expert help to tackle inactivity. As part of this change we will no longer directly provide an activity tracking and challenge function for employees. Please contact Andrew Watson if you would to discuss our planned new model for workplace physical activity on awatson@cspnetwork.org / 07739 657732. Let’s work together to make active working the norm!